The quest for the quickest (and healthiest) pizza continues! One dedicated Snack-Girl reader, Theresa, sent me her solution for a pizza makeover after I posted English Muffin Pizza. I think these are a GREAT idea. I reviewed Triscuits, and I think they are very healthy for a packaged snack. They include just wheat, oil, and salt for ingredients. I love these because they are bite-sized. They ARE much crunchier, and so easy to make. These would make a great party snack. One caveat, they did not taste delicious cold. I would serve these as soon as possible out of the oven. I used my broiler, but Theresa used her microwave. Give it a try! Place Triscuits on a rimmed cookie sheet (lined with either parchment paper or aluminum foil for easy clean-up). Spread on sauce, and sprinkle on cheese. Toast until cheese is melted and serve immediately. Wow cant wait to try this!! What a great idea. I have been really working on snacking less and when I do really focusing on healthy snacks. What a great idea. Gonna try soon! I'm gonna put a nice sliced mushroom on top of each and put in toaster oven!! Love this recipe, a nice treat in the afternoon. Thanks for keeping these on your site! I totally forgot all about them! I too love English muffin pizzas. To keep the pizzas from being soggy, I toast the muffins before putting the sauce and cheese on them. Then broil to melt cheese and heat any additional toppings you may like. triscuit,brush olive oil,grape tomato slice,mozarella cheese,bake 350 till cheese melted. This is a take on sliced bread with tomato & cheese. We started making these recently. They are great and fast and delicious! I LOVE using a giant Portobella cap as a pizza base too. I'm a huge pizza fan and on WW, so I'm trying to avoid the carby crusts. I never even liked mushrooms until I turned it into a pizza! You just have to bake the "crust" a little before adding your toppings so the whole thing doesn't get too soggy. I also like to blot my warmed portobella crust after taking it out of the toaster oven since mushrooms release so much moisture. Try it- you won't be disappointed! Your snacks rock and really help me out. I just started WW and look forward to trying all your recipes and tips. Question, how many points would it increase if I added some Hormel Turkey Pepperoni? You know what's good on these? Turkey pepperoni! Just found this website because it was recommended to me at a WW meeting. I'm in love! 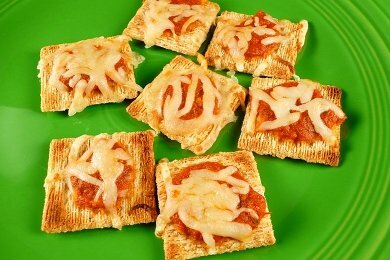 I just had to post becuase although I've never tried these - I usually put salsa and mexican cheese and put in the toaster oven! NACHOES!! YUM! I've been making these for years but use cocktail sauce instead of tomato sauce for a little more zip! Throw the English muffins in the toaster before adding the sauce. Yummy and crunchy! can we use salsa instead of pizza sauce? I did this with my high schoolers and they loved it. Getting past their worry, concern, and turned up faces in trying something new was the hardest part :-) but after that it was a piece of cake ;-). Thanks!